First Edition Curious George Sells for $26,000! A first edition Curious George sold at Heritage Auctions for $26,290. This surpasses the $21,850 paid for the first edition Curious George sold at PBA Galleries in 2007. The Heritage sale took place in the September 2011 Beverly Hills Signature Rare Books Auction. 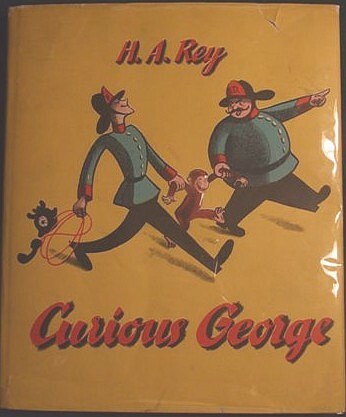 The link to the Curious George lot #37070 at Heritage (you will have to login to Heritage to see the final sale price). Lest one thinks first edition Curious George’s are popping up hither and thither, the seller of the 2007 book at PBA Galleries assures me that the Heritage copy is the very same book. 1stedition.net promoted the 2007 item, see Curious George First Edition Identification for photos of the covers, spine, dust jacket, and DJ flaps. Comparing the tears on the dust jacket confirms the two books are one and the same. H. A. Rey. Curious George. Boston: Houghton Mifflin, 1941. First edition. Quarto. Unpaginated. Illustrations by the author. Publisher’s brick red cloth with Curious George vignette in black on front board and lettering in black on spine. Illustrated endpapers. Original dust jacket with $1.75 price. A couple of faint scratches to cloth on rear board. Original unrestored dust jacket is rubbed, with a few chips to extremities and spine ends; also with a few short closed tears and shallow creases at edges. Rear flap with Bullock’s Wilshire price sticker ($1.75). A remarkably crisp, bright copy in near fine condition. We could locate only one other record of this title in dust jacket selling at auction in the past 35 years, and that was this very copy. Extremely scarce. A classic children’s book, Curious George burst upon the scene in 1941, a year after H. A. Rey and his wife Margret (both German Jews) had escaped Paris only hours ahead of the Nazis. The Reys had fashioned makeshift bicycles from spare parts and fled Europe with possessions limited only to clothes, food, and five manuscripts, one of which was Curious George. Featuring one of the most beloved characters in children’s literature, Curious George has never been out of print, and the story of the curious little monkey continues to delight and entertain children seventy years after its first publication. A superb copy, in the remarkably rare original dust jacket. Estimate: $15,000 – up. Obviously this $26,000 sale will impact the other first edition books in the H.A. Rey Curious George series. In addition – guilty by association – there will likely be a ripple effect on the other scarce high-end contemporary children’s picturebooks, such as Make Way For Ducklings, Little House, and the scarcer Dr. Seuss and Caldecott Medal books. A very nice copy of the first edition Little House sold for nearly $10,000 at the same 2007 PBA Galleries auction of the Curious George.